I'm not sure what I'd do if I opened the stall door and saw this. Perhaps shut it and back out of the restroom slowly? "I found something shocking in the bathroom," tweeted Mea. She sure did. And she doesn't appear to be the only one who thinks so. 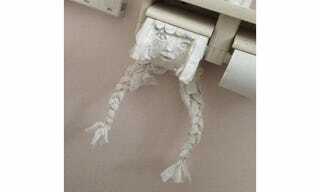 These "toilet paper art" photos have been retweeted nearly 50,000 times after being uploaded yesterday. That's a lot! According to Mea, a friend of hers actually created this, and here you can see how the toilet paper sculpture was put together.